Bagan, the most famous archaeological site of Myanmar can be reached by a 1 hour flight from Yangon… or by an 18+ hour tortuous train ride. That’s the transportation we chose, to save some money and get a broader perspective on the country. 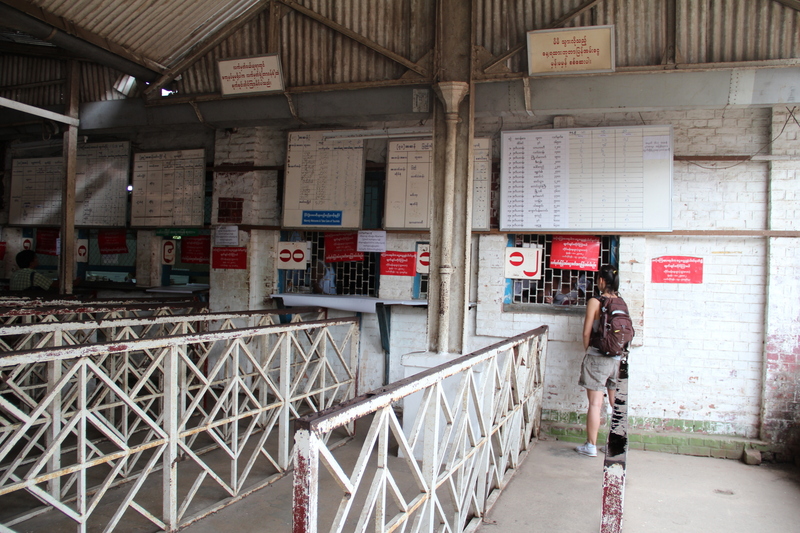 The train was departing every day at 4pm, and we got our tickets in advance, at the basic booking office diagonally opposite from the Shangri La Hotel. 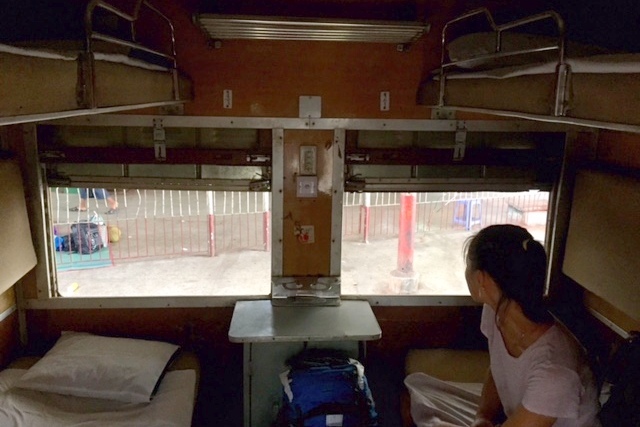 The sleeper category cost $16 for a bunk bed in a 4 people compartment. The train was so old and dirty, that it made me feel nostalgia of the trains in India. But the worse part of the trip was how bumpy it was; it’s hard to believe it if you haven’t experienced it, I didn’t know trains could be so unstable. For the first couple hours, we sat down on the lower bunk, trying to relax and move with the flow… sometimes, we would be thrown up in the air and bounce back violently. When we laid down to sleep, the position helped, but the bounces seemed to get worse a few hours in. We still managed to get a full night sleep, just because at this point I think we can sleep pretty much anywhere. Looking through the window was quite interesting. 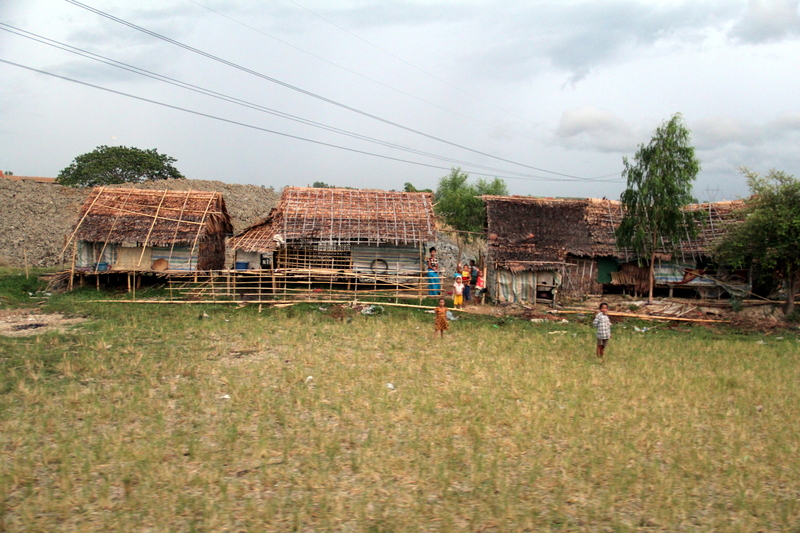 We passed numerous villages, farming communities and lots of smiley, hand-waving children. 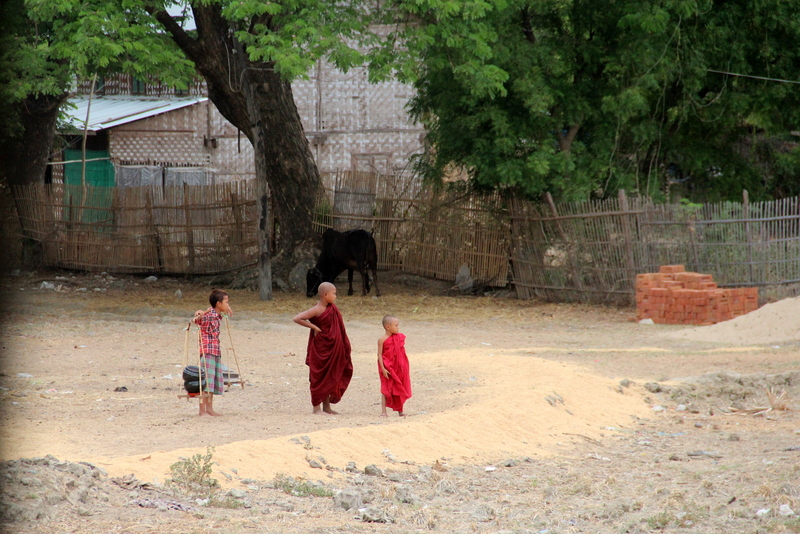 We soaked into the real Myanmar, rural and poor. At some point, the train stopped; we had lost the last wagon. I’m not kidding, the last wagon, the one behind ours, somehow got detached from the rest of the train. 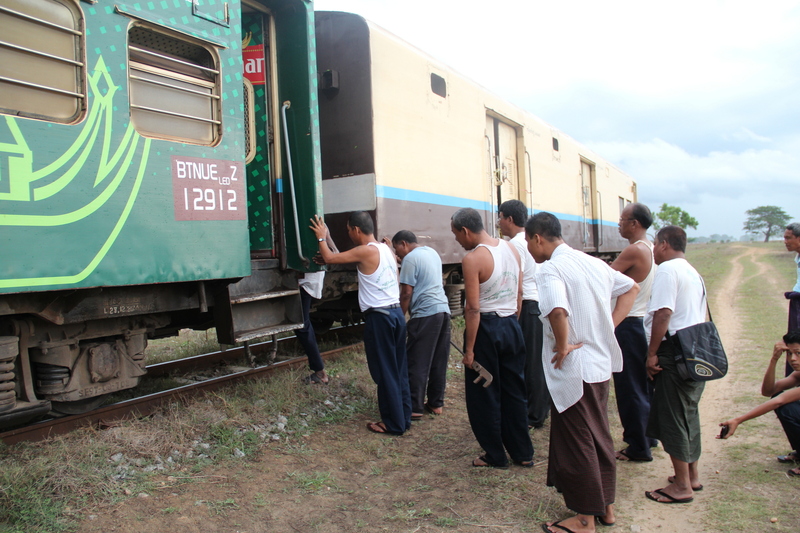 As the train moved backwards slowly, I followed a bunch of the locals and jumped out to stretch and observe the repair work. 10 minutes hitting parts with a wrench, and we were ready to continue. Before night fall, we ate all the snacks that we had packed in the city, respectfully declining the offer to eat in the restaurant wagon, and passed out. In the middle of the night, we woke up and realized we weren’t moving. There was absolute silence, and we thought for a moment that we might have gotten detached from the train and left behind :S But no, the whole train was connected and quiet. 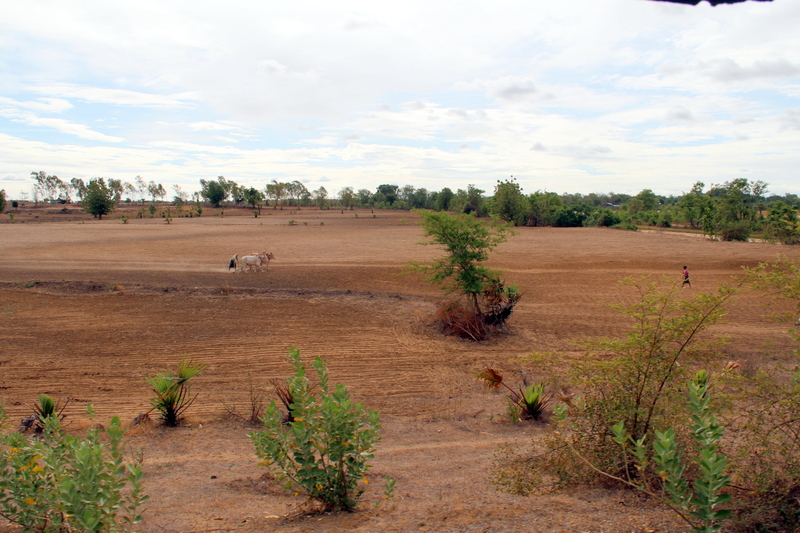 In the morning, we were told that we had to stop for 4-5 hours because another train had had issues on the same rail, and that we would get to Bagan at 3pm instead of the planned 9:30am. Apparently the average delay in this line is 2-3 hours anyway. We ate the load of cookies we had with us, and enjoyed the countryside scenery that passed through our window one last time. I was about to take train Yangon – Bagan when I’m there on coming Oct. Thank for your post, I need to re-consider it. The uncomfortableness and delay few hours really need to take into consideration. yes, but I wonder if bus is much better. I want to experience train as well. Any idea how much the first class and second class tickets cost? And whether it’ll be advisable to get those? I believe they were each about half the price of the next class… but I would defnitely advise against getting those. The trip is too long and bumpy, and you want to get some sleep ahead of visiting the temples. Not worth saving a few dollars.